If this card is Special Summoned from the Graveyard: You can destroy all face-up monsters your opponent controls. You cannot conduct your Battle Phase the turn you activate this effect. Thunderclap Skywolf is a cost-free Lightning Vortex from the grave. Strong stats, but its Type and Level don’t lend to supporting it much. Simple effect: Special Summon it from the grave to wipe your opponents face-up monsters off the board. A great board-clearing effect, easily accessible with the amount of grave summoning effects in the game (Monster Reborn and CoTH to name a few). The problem is the synergy Thunderclap would have in decks. Dropping it into a random deck would cause some problems unless it was something like a Chaos Deck that Special Summons from the graveyard with the previously mentioned cards. Losing the Battle Phase can be a big drawback, but lends to it being part of a Soul Charge play to get massive bang for your buck while still losing your Battle Phase to Soul Charge. Not sure if you’d have to use Skywolf twice in a turn, but it is worth saying that it is not once per turn. Thunderclap Skywolf is a Level 7 Light Thunder-type monster with 2500 Atk and 2000 Def. Stats are very Dark Magician, which isn’t great. The effect is ok but only triggers when Skywolf is Special Summoned from the grave. You get to not conduct your Battle Phase but destroy all of your opponent’s Face-Up Monsters. It’s a decent effect because it doesn’t target, and it’s a great target for Back to the Front during your opponent’s Battle Phase. But that makes it a decent defensive play. And defense doesn’t win games (old record). Thunderclap would have been better as a Level 8 for Trade-In. As a Level 7 with only other cards able to trigger it’s effect, SKywolf is just average. Well with more Thunder support seeming to be on the horizon, it will be interesting to look at some Thunder monsters. This one seems to be somewhat ignored though, Thunderclap Skywolf. Skywolf is a Level 7 LIGHT Thunder with 2500 ATK and 2000 DEF. Stats are good for a Level 7. LIGHT is a good attribute, but Thunder is an undersupported type. If Skywolf is Special Summoned from the GY, you can destroy all face-up monsters your opponent controls but you cannot conduct the Battle Phase the turn you use this effect. There are so many cards that help you revive from the GY: Call of the Haunted, Oasis of the Dragon Souls, Return to the Frontlines, Monster Reborn, Soul Charge, etc. The first three can be used on your opponents turn to ignore the fact you cannot conduct the Battle Phase. Even if you have to use it on your turn, sometimes giving up the Battle Phase can be worth killing some major threats. 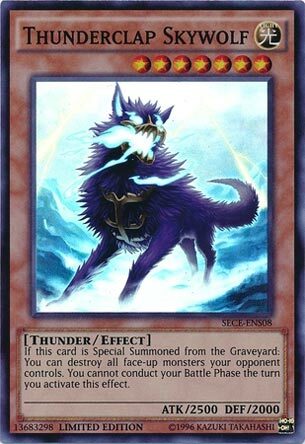 Thunderclap Skywolf is a cool card worth experimenting with. You might have to build a deck around it though until we get future Thunder support. Art: 4/5 Looks kinda like a Zombie if you ask me. This card, while not a promo, is an overlooked Super Rare from Secrets of Eternity. Level 7, 2500 attack, Light, and the often ignored, under supported Thunder type here. Thunderclap Skywolf is a very powerful, unwieldy card. Level 7 obviously requires two tributes, but he gets around that as his effect only comes in use if he is Special Summoned. When done (from the Graveyard, take note) you can destroy all face-up Monsters your opponent controls. You do, however, sacrifice your Battle Phase. To fully take advantage of this, you’re likely going to want to dump this Monster even to let him sit in your Graveyard just to wait. Decks that can mill easily would be able to take easy advantage of this, something like Lightsworn, for one. But he’s a good asset in the Hand too for a discard cost for about anything, again, since you WANT this card in your Graveyard. The loss of the Battle Phase is irritating, but you can still burn, and you’re likely destroying at least a couple Monsters, and then you have a 2500 attacker on your Field too. Art: 5/5 Love this, very evil looking for a Light Monster, no?